Support Home Paya Virtual Terminal How do I void a transaction in the Virtual Terminal? Please note: that transactions must be in an Open Batch in order to be voided. After logging into Paya Virtual Terminal, go to the Reporting tab at the top of the Home page. 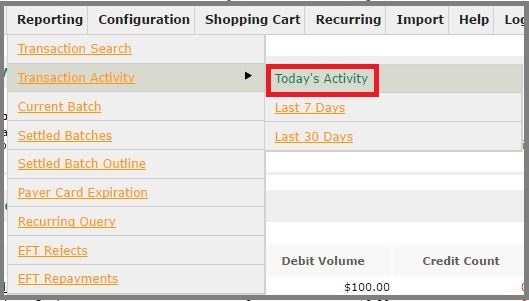 Hover over Transaction Activity and the sub-menu for three transaction activity reports will appear. Select the transaction that you would like to void by verifying your customer's pertinent customer information (card number, amount processed, expiration date, etc.). To the right side of the page under the Options column, click Void. A pop-up box will appear to confirm that you want to void this transaction, Click Yes. The transaction is now voided, but still searchable in the Transaction Search option.